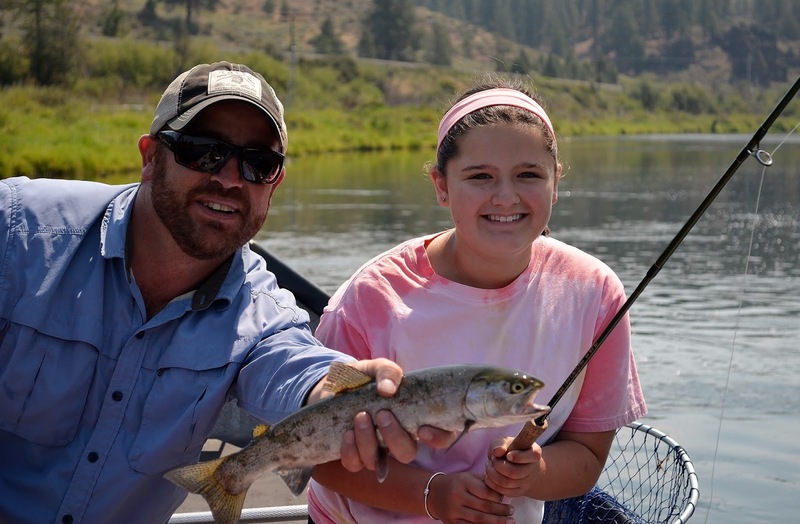 A great night on the Rogue River! 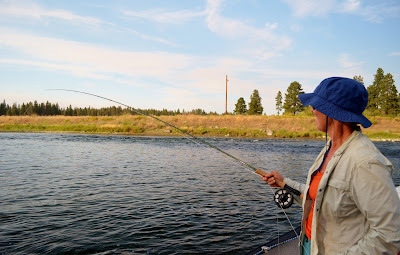 You don't get many days on the Rogue River like I had yesterday! A client who wants to row your boat so they can build some oarsman skills for their local river is a rare treat. The same client that wants to only swing flies, but will leisurely fish between swing runs is even better. But, a client who absolutely gets it, and has as deep of a love for steelhead and the beauty of a well swung fly is priceless. I'm sure the words, "I'm one of those guys you don't have to micromanage, just let me know where the major holding areas of the run are, and relax--grab a rod and follow me through." are the words every guide would love to hear. That's how it went last night! Within fifteen minutes of fishing, Carl had swung up the most beautiful half pounder that thought it was a tiger! A couple minutes later he swung the Emerald tail-out, where midway through the growl of his real revealed another vicious take. Carl missed the fish, but like any well seasoned steelheader, threw the exact same cast knowing the fish was probably still grabby. Carl's creation swam its way to the battle line and presented itself in as scrumptious as it could. It was to much for the chromed monster to stand. From a 100 yards up river I could see the rod tip dive and the reel sing as the monster smashed the offering. Carl was to ready for the take and didn't give the fish enough time, and the line became depressingly slack. I expected to see some sort of anger, or aggravation on Carl's face, but there was none of that --just a smile from ear to ear, "Did you see that?" bellowed up the river, "I got my Fix!" I have never seen someone so happy to miss a fish. I waded my way down and handed Carl another fly, trying to switch things up to induce another strike. Carl fished it a couple swings, just to appease me, then said "Any fish that gives me two chances, that I miss, deserves to be left alone." Its such a treat to fish with some one who gets it will make your whole week, thanks Carl for the great trip. 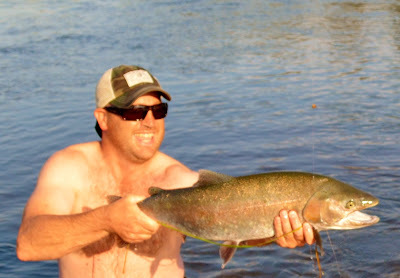 Typical Rogue River Steelhead Run! 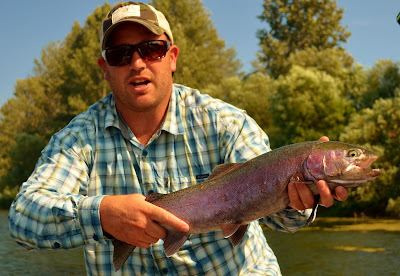 Beautiful Rogue River Half Pounder on the swing! Is it the tug, or the fight? 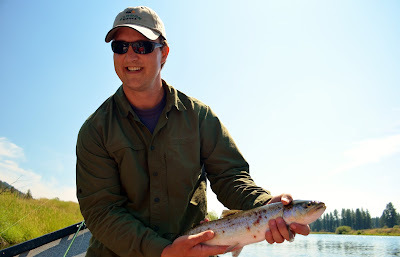 I am around big fish a lot, but I still enjoy the tug of the small ones. Maybe its all about my roots, or just that connection with the wild. We have a small lake close to our house that is full with warm water game-fish. When the boys(my Labs) give me that, I gotta swim look, we run off to this small lake. I whip out the 3wt and just have a ball! Seems funny to all my friends that I would enjoy such small fish, but these fish always take me back to the time when I was a kid- a simpler time when didn't have to catch the biggest fish in the river. A time when every tug was a gift, and it was more important to enjoy the water and all her depths hold. 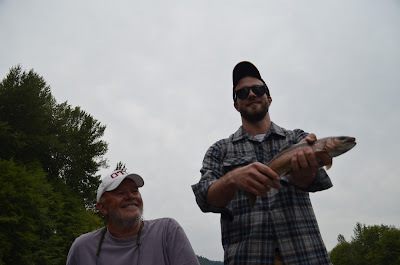 As a Guide its my Job to get my clients into the big ones, but I hope I provide more than that, I hope I pass on the same reverence for the tug that I felt as a kid. Regardless of the size, or numbers of fish, fishing should be fun, and if it takes little pan fish to remind me of that fact so be it. What a fight, almost slipped the drag! Can I get Him Dad? 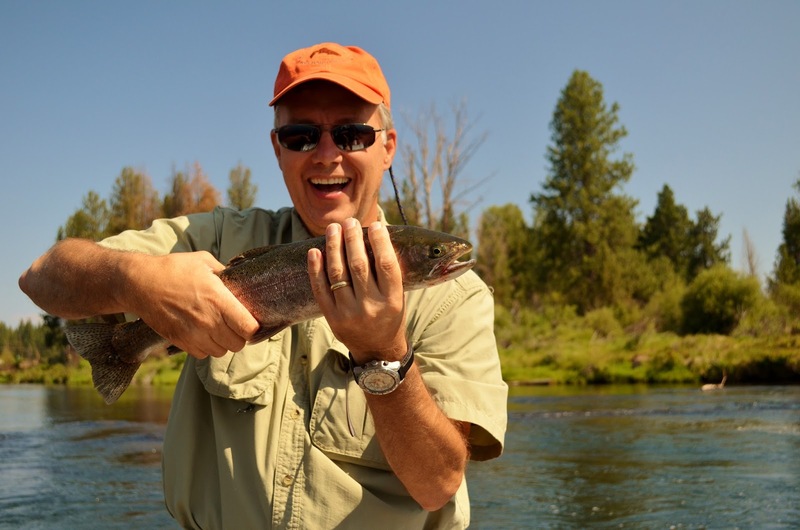 Labels: southern Oregon fly fishing, Southern Oregon Fly Fishing Guide, southern Oregon flyfishing, Southern Oregon guide, swinging for trout, Upper Rogue River Fly fishing, Williamson river fly fishing. It has been a busy week. 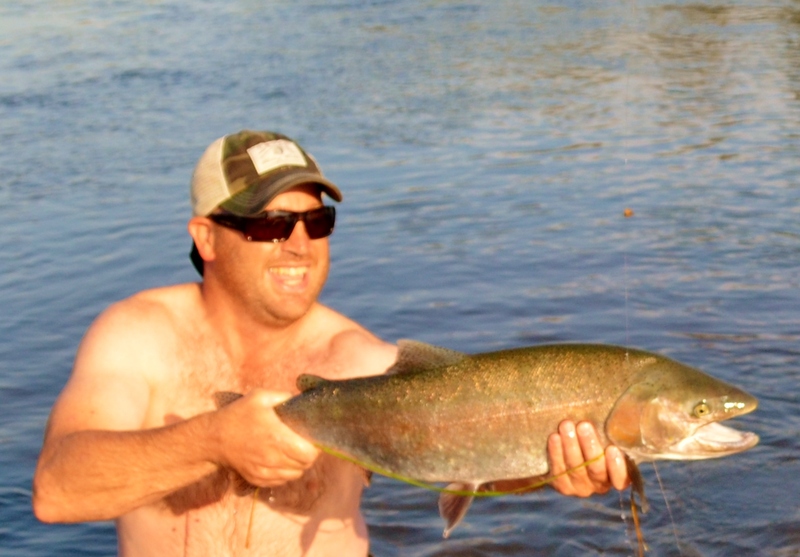 The Upper Rogue is starting to show summer steelhead. We have been hooking a few on swung flies. The river has raised and I expect them to shoot up! The Klamath Basin is still producing, although the full moon has slowed fishing as of late. Swinging Flies with the small speys are still producing, which makes me happy, happy, happy, as there is no better way to fish! Once the Rogue starts to drop and the moon goes away the rivers will come alive. Here are a couple pictures from the last week. 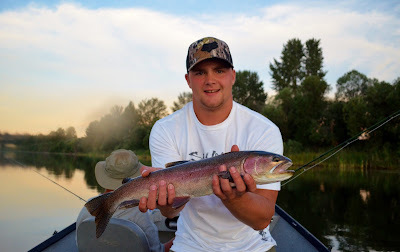 Nice Wood River Trout on the swing! 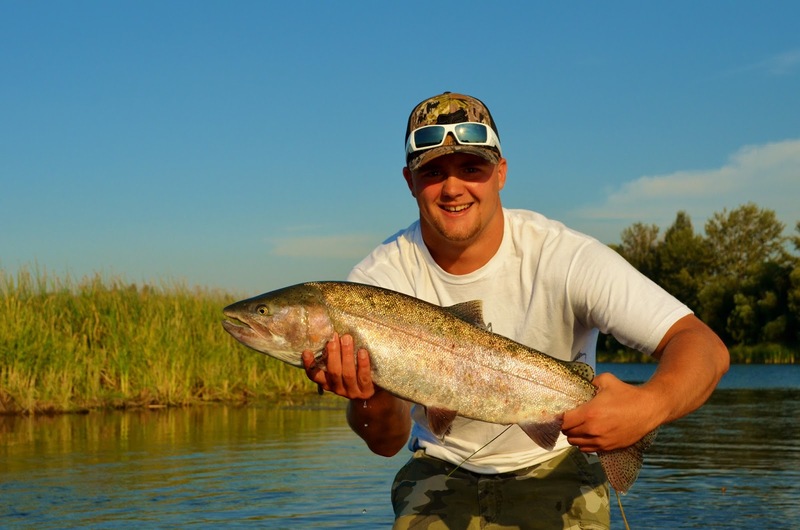 Nice little Rogue River Steelhead-- Good Job Seth, what a fight on a 3 wt. 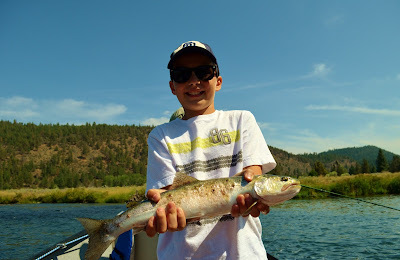 Aaron with his first Wood River redband. I was just wondering around our local Costco and found out all the rumors are true. They ares selling Sage, that's right, Sage Ones for a huge markdown. If I were a small fly shop I would be outraged, as Sage sets the price for these rods and you have to sell them at that price. The local Shops have to sell these same rods for $750. Just like everything else, I guess Fly Shops are destined to follow--no more ma and pa stores, just the big discounters. Being a part of peoples memories! The best part of my job is the smiles. I get to be a part of peoples memories. It is absolutely the best when families get together, and use me as a vehicle for memories. I got into guiding to help people catch fish, and promote the appreciation of wild rivers and the fish that lurk in their depths, but I have gained so much more. I am allowed to be a part of peoples memories, their lives, a responsibility I don't take lightly. This is about way more than fishing, its about memories or even new lifestyles that are gained. I get to see people who have never held a fly rod, get bit by the fly fishing bug at their first tug. 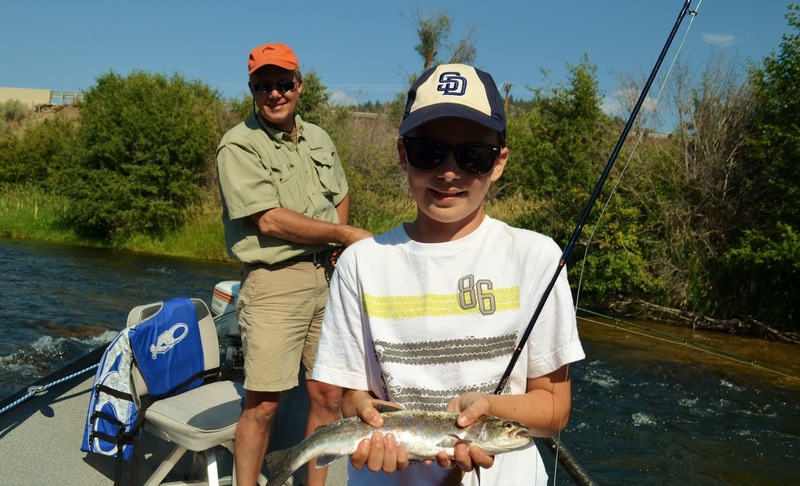 I've witnessed family bonds tighten with each released fish. No sir, this is way more important than fishing--this is life in one of its simplest forms. Man and nature--its good for the Soul. I am honored and privileged to be able to be a part of these memories. Here are some pictures from last weeks memories. Fish Slime ...Naw! She had a ball! He got good on the switch rod! The smiles are what it's all about!